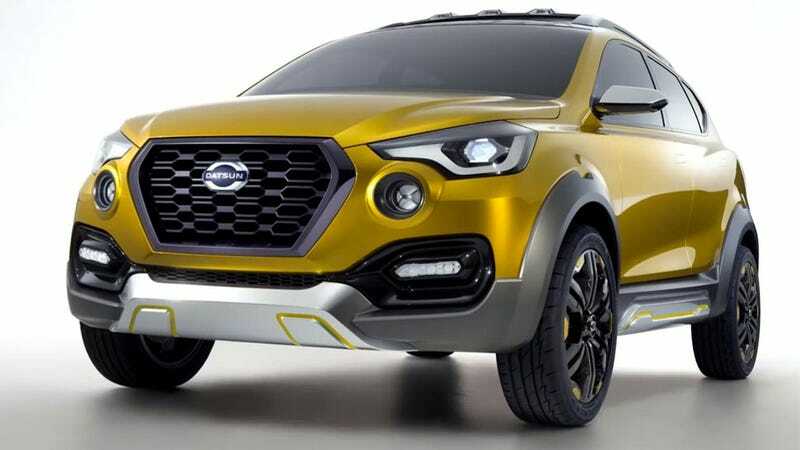 At the Delhi Auto Show, Nissan’s division for “high-growth” markets, Datsun, showed a concept based on their entry-level Go platform, and it suggests a refreshingly optimistic view of the future of car-buying in countries like India. The Go-Cross is as, you probably figured out on the big chalkboard in your lab/dungeon, a crossover version of their $7,000 Go hatchback. It’s lifted, it’s got some more aggressive-looking bodywork, but it’s clearly part of Datsun’s family look, with what Datsun calls the ‘D-cut grille’ and the logo shape motif forming a pattern on the roof. What’s interesting about the Go-Cross concept (aside from those driving lights with that wide ‘x” thing in them – I like those) is that it shows Datsun now thinks it makes sense to target young car buyers who are looking to buy a car for something beyond just basic transportation. That’s good to see, especially here in America, where we get inundated with the same article about how Millenials don’t care about cars over and over again. I GET IT, they love the Facebooks and the HAM radios and sexting and whatever. Datsun’s first two entries – the Go and the 7 (non-American)-passenger Go+, were cheap, basic transportation vehicles, which is what the Indian market really needed at the time. Now, just a few years later, Datsun is learning what Indian companies like Mahindra have been seeing for a while: there’s a growing market for cars capable of having some fun in India. Usually, the nature of the Indian driving experience means that driving for pleasure is more likely to include an off-road element. That’s why for a good while the closest thing India made to a ‘performance’ car was a sporty SUV like the Mahindra XUV500, and why a crossover-type of car makes sense now for Datsun. Let’s just hope Datsun is considering making the cars a little less likely to be such deathtraps. I mean, I know safety doesn’t sell, but, still.